Apple today announced financial results for the third fiscal quarter and second calendar quarter of 2015. For the quarter, Apple posted revenue of $49.6 billion and net quarterly profit of $10.7 billion, or $1.85 per diluted share, compared to revenue of $37.4 billion and net quarterly profit of $7.7 billion, or $1.28 per diluted share, in the year-ago quarter. Gross margin for the quarter was 39.7 percent compared to 39.4 percent in the year-ago quarter, with international sales accounting for 64 percent of revenue. Apple also declared an upcoming dividend payment of $0.52 per share, payable on August 13 to shareholders of record as of August 10. The company currently holds $202.8 billion in cash and marketable securities. Apple sold 47.5 million iPhones during the quarter, up from 35.2 million a year earlier, while Mac sales registered 4.8 million units, up from 4.4 million units in the year-ago quarter. iPad sales continued to decline, however, falling to 10.9 million from 13.3 million. Apple's guidance for the fourth quarter of fiscal 2015 includes expected revenue of $49-51 billion and gross margin between 38.5 and 39.5 percent. Apple will provide live streaming of its fiscal Q3 2015 financial results conference call at 2:00 PM Pacific, and MacRumors will update this story with coverage of the conference call highlights. 2:58 pm: The call is complete! 2:58 pm: A: Our June sales were higher than April or May. June sales were the highest. Watch had a more backended skewing. Phone followed normal, seasonal kind of pattern. If you look at, honing in on Greater China results, no obvious impact from last quarter in the Greater China numbers. With aggregate or consolidated number being 112%, it's hard to find a lot of bad things in the numbers. 2:56 pm: Would have higher gross margin if it weren't for currencies. Look at every country except China and it's weaker against the dollar. Don't like changing pricing. Circumstances around the world where we had no choice because currency move was so large. Look, in the long run a strong US dollar is not a positive for International business. Normal to see drop in demand as prices go up. Remarkable to see how resilient iPhone sales have been because we have increased sales and we've increased market share in all our geographies around the world without exception. 2:55 pm: Q: Talk about FX, but not from direct impact... what are you seeing in terms of demand as you raise prices in various geographies? How are you thinking about it in next iPhone cycle in terms of normalizing pricing for some currencies? 2:54 pm: A: In some geographies, the way that we win is to get switchers. In others the way we win is to get people to buy their first smartphone. In others, we get people to upgrade their iPhone. In some it's two of those. In others it's all three. We are very focused. Getting our message out with ads is how we do that. 2:54 pm: Q: New ads? If it's not an iPhone it's not an iPhone. 2:53 pm: For all of us that travel there so much, you can see this occurring. We would be foolish to change our plans. China is a fantastic geography with an incredible, unprecedented level of opportunity there. We're going to be there. 2:52 pm: Q: We remain extremely bullish on China, we continue to invest. Nothing has changed our fundamental view that China will remain Apple's largest market in the future. Equity markets has recently been volatile, could create speed bumps in near term. Despite volatility in the Chinese market, they're still up 90% in the last year. Up 20% year to date. These numbers are ones all of us would love. Stock market participation among Chinese households is fairly narrow, very concentrated. I think generally this has been, at least as we see it, this worry is probably overstated. We're not changing anything. We have the pedal to the metal, expanding stores, indirect channel. As you point out, this is a major point, LTE penetration is only at 12%. China doesn't possess level of fiber that some other countries do, in order to get great video performance, raising that penetration is really great. That really plays to an incredible smartphone future there. Also, I can't overstate this the rise of the middle class there is continuing and it's transforming China. 2:50 pm: Q: Some concern in China with stock market and economically. More stores and broader distribution, 4G infrastructure is playing out, but economy might be weakening. Is phone a discretionary purchase? 2:49 pm: In emerging markets, our share isn't high in any of them, same with many developed markets. I look around and see opportunity left and right. 2:49 pm: The Mac continues to perform very well. Apple Pay, Apple Music, I'm still bullish on iPad. Incredible productivity enhancements coming in. Split view, slide over, picture in picture. Enterprise is picking up. More and more companies are contracting for or writing apps themselves. And I believe that the iPad consumer upgrade cycle will eventually occur. If we look at usage statistics on iPad, it remains great. Compare to next competitor, we're 6x greater. It's not like people have forgotten iPad or anything. 2:48 pm: A: We think the phone has a lot of legs left to it. Tons of innovation left on the phone. We're in the early innings, not the late innings. Market rate of growth in the long haul will also be impressive. Multiple winners here. That's how I see it. In terms of other things that we're doing, we have some great capabilities and great teams and we can do more than one thing. We have other things that we're working on as well. At the aggregate level we still remain very focused. That's how we do things and get the level of quality. 2:46 pm: Q: iPhone, iPad and iPod. iPhone looks like it has many tough comps next few quarters. Broadening your reliance on some products? Apple Radio, Apple Watch, Apple Pay? Are you increasingly focusing on peripheral activities? 2:42 pm: We don't do MBA analysis of "There's X people in price band so we can only get X-Y%"
2:41 pm: Q: If you think about iPhone and your market share in premium category, how do you think about it? I've seen market data, says 60% market share on phones above $300. 90% market share for phones above $600. Could you talk about how you think about your market share, where you play, given that ASP is comfortably above $600. What is your market share above $500 in smartphones? How do we think about that market share going forward? 2:40 pm: Feel fantastic about what we've done and delivered. Never gone anywhere without the watch, I'm not just the CEO, I'm that attached to it. 2:40 pm: Customer sat is off the charts. If you get customer sat, you can do fairly well over time. Also learned a lot about managing quite an assortment and so forth. 2:39 pm: We've learned a lot about the buying experience, based on that, we're planning to expand our channel before the holiday because we're convinced that the watch is going to be one of the top gifts of the holiday season. 2:39 pm: As I look at all of these things, we feel really great about how we did. Objective wasn't primarily sales. Beyond the very good news on sales, we're more excited about the possibilities. Native apps coming, they're going to be killer. 2:38 pm: Sales of the watch did exceed expectations. Supply still trailed demand at the end of the quarter. Apple Watch sell through was higher than comparable launch periods of original iPhone and iPad. 2:37 pm: To give some color... look at other product categories, and look at revenue in this category, it would not be an accurate thing to look at sequential change or year over year change and assume that were total watch revenue. 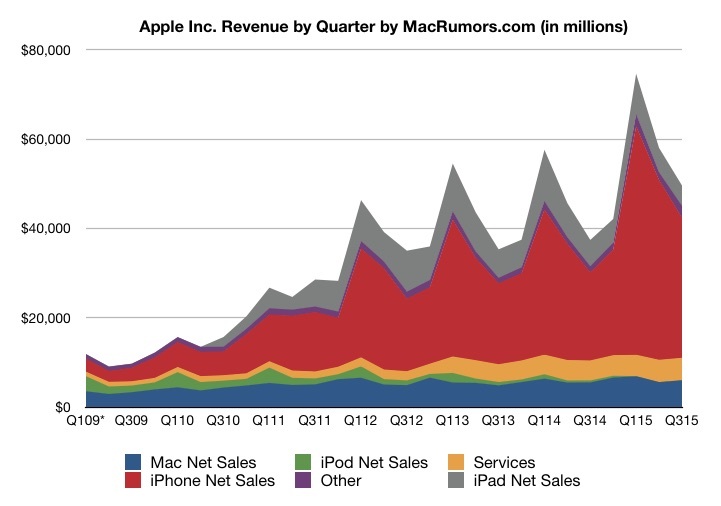 Sequentially and year over year, iPod is shrinking. Other accessories are shrinking. 2:37 pm: A: We made a decision back in September not to disclose shipments on the Watch. Not on whether we were transparent, but not to give too much to competitors. 2:36 pm: Q: More thoughts on Apple Watch? 2:35 pm: As we look at it on a macro level, every cycle is different, not everything in our control. Currency markets are different from one year to the next. Present an additional challenge given where the dollar has moved. Commodity markets are different from one year to another. 2:35 pm: Q: More thoughts on gross margin? 2:32 pm: A: We have hedges but will be an impact. Seasonality for back to school, and preparation for big fall. Commodity costs continue to be favorable, so partial offset. 2:32 pm: Q: Foreign exchange headwinds? 2:30 pm: Everybody is going to own a smartphone, we've proven that we can compete for a fair number of those. 2:29 pm: A: We purposely give guidance for the quarter. The numbers that we have indicated growth in the revenue means that iPhone would have another stellar quarter. Very confident that this quarter is great. How the future looks? We'll take it one quarter at a time. 2:28 pm: Q: You're lapping some pretty significant comps related to upgrades and significant growth in China. What is framework that you use to convince yourselves that iPhone units can continue to grow in the longer term? 2:28 pm: Highest Android switcher rate we've observed. iPhone is doing outstanding. 2:27 pm: A: 35% growth is almost 3x the market, if you look at it at a narrower regional level, grew 4x market in Europe, Japan 5x market. Doubled in Korea vs market that was shrinking, India grew at 93%. 2:25 pm: Q: Year on year iPhone growth was strong, but sequential numbers were weaker than in the past. Why drain channel inventory? 2:24 pm: Luca is going over the forward-looking estimates from the press release. 2:23 pm: $202.8 billion in cash, 89% of the total is offshore. 2:22 pm: Global store count of 456, 190 outside the US. 40 stores open in Greater China by middle of next year. 2:22 pm: Retail and online stores had strong quarter, customer visits up 49% driven by strong interest in Apple Watch. Mobile traffic to online stores during quarter equaled desktop traffic for first time ever. 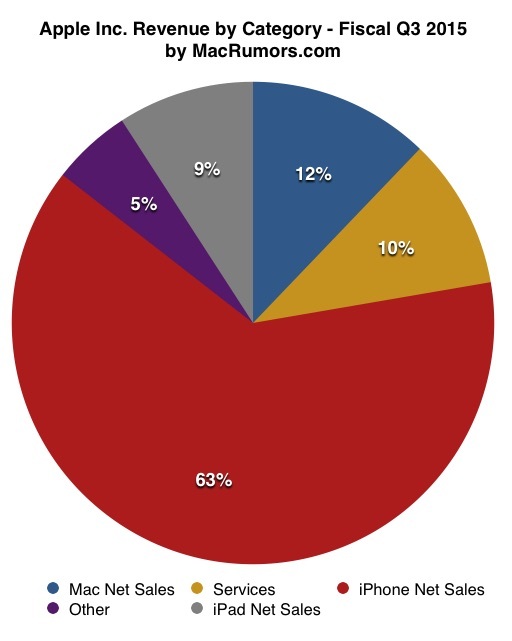 2:20 pm: Mentioning corporate adoption of iPad across numerous countries and companies. 2:18 pm: We are extremely successful where we compete for tablets. 76% of tablet market for tablets over $200. 2:18 pm: 97% customer satisfaction rate on iPad Air 2. More than half of buyers who want to get a tablet plan to buy an iPad. 2:17 pm: Mac growth was driven by portables, including strong customer reception of the new MacBook. 2:16 pm: 35% year over year growth in iPhone, demand for 6 and 6 Plus has been terrific. 2:15 pm: Drop of 1 million units in channel inventory, making results more impressive. 2:15 pm: Very challenging foreign exchange environment continues. 2:14 pm: Growth driven by tremendous growth in iPhone and Apple Watch. 2:14 pm: Luca coming on the call now. 2:14 pm: Very hard at work on exciting pipeline of new hardware, software and services. Passionately committed to leaving the world better than we found it. 2:14 pm: 700 universities and colleges are going to be adapting Apple Pay too. 2:13 pm: Apple Pay coming to Square Reader this fall. 2:12 pm: Launched Apple Pay in the UK recently. 2:12 pm: Millions are tuning into Beats 1. 2:11 pm: 15,000 artists signed up for Connect. 2:11 pm: Millions and millions of customers are already experiencing the new service, and the numbers are growing substantially every day. 2:11 pm: Thrilled with the response to Apple Music. 2:11 pm: Citing partners for the News app coming in iOS 9. 2:10 pm: Talking about updated OS's coming this fall, OS X El Capitan, iOS 9, WatchOS 2. 2:08 pm: Just the beginning of what this new platform can deliver. With WatchOS 2, developers can build richer and more powerful native apps. 2:08 pm: User experience for Apple Pay and Siri is nothing short of incredible. Customers are enjoying 8500 third-party apps. 2:07 pm: Doctors and researchers at leading hospitals in the US and Europe are putting Apple Watch to work improving patients' lives. 2:07 pm: Possibilities for Apple Watch are enormous. 2:07 pm: Feedback is incredibly positive, very happy with customer satisfaction and usage statistics. 97% customer satisfaction rate for Apple Watch, and we hear from people every day about the impact it's having on health, daily routines and how they communicate. 94% of Apple Watch owners wear and use it every day. 2:06 pm: Major highlight was the launch of the Apple Watch in April. Started taking preorders in 9 countries on April 10, demand immediately exceeded supply. We delayed availability of Apple Watch in our own retail stores until mid-June. Huge progress with production ramp, expanded into 6 additional countries in late June. Expanded Apple Watch availability to 19 countries, with three more countries coming at the end of the month. 2:05 pm: Generated 5 billion in services revenue, setting a new all-time record. Within services, App Store produced best quarter ever with revenue growing 24%. Results from Greater China were outstanding, revenue growth of 112%, iPhone unit growth of 87%. Particularly impressive given IDC's estimate of only 5% growth for greater china smartphone market. Highest ever PC market share in the segment, Mac sales up 33% over last year. Ecosystem continues to grow at a very fast pace, App Store revenue more than doubled in the quarter. 2:04 pm: Record quarter for Mac, unit growth of 9% vs market contraction of 12%. 2:04 pm: Experienced highest switcher rate from Android that we've ever measured. iPhone customer metrics were tremendous, iPhone has highest customer satisfaction rate of any smartphone brand by a wide margin. Among iPhone owners planning to purchase a new phone, 86% plan to purchase a new iPhone. Just 50% for next highest brand measured. 2:03 pm: Established new June quarter record for iPhone, sales up 35%, 3x rate of growth of the smartphone market. Gained share in all geographic segments. 2:03 pm: Topped internal expectations for sales of iPhone, iPad, Mac and Apple Watch. 2:03 pm: Reduced channel inventory across product lines by 1 million units and challenging FX environment. 2:02 pm: Year over year growth rate accelerated over the first half of fiscal 2015. Revenues up 35%, earnings up 45%. 2:02 pm: It's been a busy and exciting quarter and I'm excited to talk to you about the highlights. We have record June quarter results. 2:01 pm: The call is beginning, with Tim Cook and Luca Maestri on the line. Not a great sign they haven't posted Apple Watch numbers. Tim Cook already said that Apple would NOT post Apple Watch numbers months before the Apple Watch even went on sale. yep. If the numbers were great they would release them like they do every other time they sell a lot of something. That's not true at all. They said, since before the watch even went on sale, that they were intentionally not going to release the numbers for competitive reasons. Anyone know why watch sales aren't included? Because it's a very small number compared with iPhone sales. They always planned to keep the watch sales secret. And it allows them to still say at their next keynote that "customers are loving the Apple Watch" and "it's been an amazing success" etc, without ever having to back that up with sales figures. Months before the release of the Watch Tim Cook announced that Watch numbers would not be disclosed for competitive reasons. I suspect he really meant it. Well when iPhones, iPads, and iPods came out I saw a lot of them in the wild, even when first released. I have only seen two Apple watches in person. A friend owns one. No one (that I encounter) seems to care about it. Looking at Apple products popularity in the past this can't be a good sign. No need to get offended by my opinion, because it's just that.. I've seen quite a few Apple Watches in the wild. See how anecdotal evidence works? Good thing you wrote "IMO" because the person with no data is just another person with just... an opinion. (Paraphrased from W. Edwards Deming).